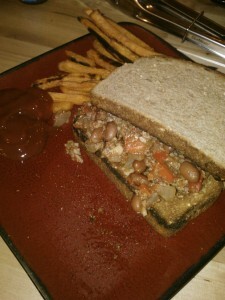 Sloppy Joes always remind me of grandfather–it’s where I got “Untidy Josephs.” I can picture myself, as a child, at a table, Untidy Joseph in hand over a plate of baked beans, laughing at his cheesy jokes. But, while this cooking stirred-up memories of my grandfather, I think its inspiration came from my healthy lunch. After eating a nice modest salad, my mind and stomach conspired to balance everything out with some meat packed bread. After a little internet hunting, I stumbled on the following. Well, I made a slight error. I was wrongly convinced that we had a tomato sauce at home. Since it was already 9:20 or so by the time I discovered my mistake, I decided to improvise by putting a can of diced tomatoes into the food processor. I think I was on the right track, but I didn’t adjust the amount of “sauce” and the mix was a little under sauced. We managed to fix the under sauce problem somewhat adequately with ketchup. Overall, paired up with some baked sweet potato fries, the Untidy Josephs were pretty good. The recipe is on the path to being a chili, but the molasses adds that needed sweetness. The red pepper and jalapeno gives nice little busts of fresh and sweet. Forget that Manwich! When I try this again, in addition to making sure that I have tomato sauce, I want to try turning up the spice just a bit with something more that jalapenos. I think those two things would take this dish from a solid weekday meal to something I crave.